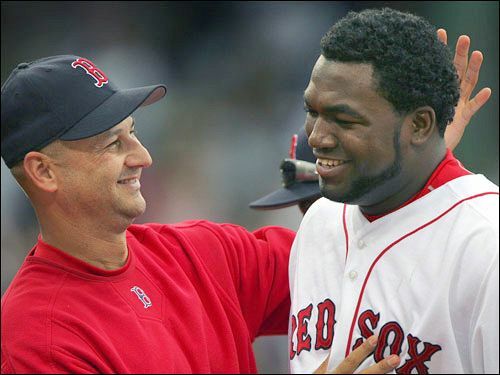 ON THIS DATE (June 24, 2006) ... David Ortiz has done it again. Ten innings had come down to a single Tom Gordon-vs.-Ortiz at-bat, with everyone in the stands and the Boston dugout sure of who would win out. The designated hitter's two-run homer provided the difference in a 5-3 win over the Phillies that extended the Red Sox' winning streak to eight. After Ortiz performed his rakish flip of the helmet, he met his screaming teammates for another fete on the diamond, another celebration of his power and, most of all, his timing. Joined by an ovation from 35,564, the jumping and playing looked as if it could have happened on a Little League field. Papelbon threw his arms around Josh Beckett. Kevin Youkilis playfully punched Willie Harris. 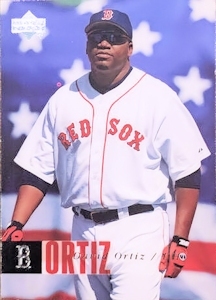 Ortiz lorded over (or under) it all. For those who remember Gordon's best days as a member of the Red Sox, it was his patented 12-to-6 curveball - a beauty of a pitch that doesn't seem to have diminished with age and miles - that Ortiz sent flying to end the first extra-inning game at Fenway this season after 3 hours and 39 minutes. ON THIS DATE (June 26, 2006) ... Mark Loretta arrived at first base in the bottom of the 12th inning, drawing a walk from Phillies right-hander Clay Condrey with Kevin Youkilis already on second and the score tied. Condrey now pitched to David Ortiz, and Ortiz (again) got the hit, a single that scored Youkilis to cap an epic 4-hour-59-minute matinee that ended 8-7, the Red Sox' ninth straight win and the first of Craig Hansen's major league career. A mob of teammates was ready to burst out of the dugout once Ortiz performed his expected heroics after the game already had seemed lost a half- inning before. On Saturday, in the 10th inning, Ortiz rocketed a walk-off two-run homer to center. This time it was a single, a breaking ball lofted onto the grass in front of the warning track in left-center and just out of Aaron Rowand's reach. The home half of the 12th started with the struggling Coco Crisp muscling an outside pitch down the left-field line for a ground-rule double. After outs from Jason Varitek and Alex Gonzalez, Youkilis singled over the outstretched glove of shortstop Rollins, taking second when Victorino bobbled the ball in left and threw home in a futile attempt to prevent Crisp from scoring the tying run. After the walk to Loretta, Ortiz plated Youklis with his second straight game-ending hit and third in his last eight home games. But because if the Red Sox can just get back around to Ortiz, it seems they always have a chance.